Prohibition-style raids may have scared some brands into keeping their bottles tightly sealed for display only, but in predictable Canadian fashion the inherent good spirit at Victoria Whisky Festival (18-21 January) couldn’t be contained, writes Dave Broom. It’s not often that a festival is dominated by talk of politics. It’s a subject which, in my experience, is studiously avoided. That sort of discussion does tend to change the atmosphere somewhat, especially after drink has been taken. And this is also Canada, where confrontation is simply not allowed. All of that changed at this year’s Victoria Whisky Festival, sadly. Every conversation at the Hotel Grand Pacific would at some point loop back to politics thanks to the Prohibition-style raids of four premises in Vancouver and Victoria. This resulted in the SMWS tastings being cancelled, with collateral damage inflicted on Gordon & MacPhail and Springbank. Under current legislation, any stock for tastings (or bars) has to be bought from the Government-controlled stores, but as these outlets don’t always carry the full Liquor Board list, the whiskies which were needed for the event had to be bought from independent retailers. It’s the Liquor Board’s right to choose what it stocks (though quite why it decides to list whiskies and then not have them on the shelves of its own stores is a topic for another day), but it seems absurd to restrict people’s ability to drink the whiskies because they have been (legally) bought in other outlets. The raids might have been the main topic of conversation, but perhaps that’s the best thing which could have happened as the full absurdity of the law has been exposed. But the show must go on – and it did, triumphantly. As ever, there were four days of events, kicking off with two tastings on Thursday when William Grant’s ambassadors descended en masse. In another part of the Hotel Grand Pacific, Davin de Kergommeaux was handing out this year's Canadian Whisky Awards in his usual dry-witted style. There were big wins for Wiser’s 35-year-old, winner of the whisky of the year, while owner Corby walked off with the Best Distiller gong. Proceedings had started with an inspiring speech from Crown Royal’s Stephen Wilson in which he spoke of the need for distillers to work together to raise the profile of Canadian whisky. With an ever-expanding range of whiskies, especially at the premium end, the oft-discussed Canadian wave appears to be building momentum. Friday saw another seven masterclasses in the evening, as a warm-up to the extraordinary logistical feat of running 45 masterclasses throughout Saturday morning and afternoon, each one preceded by polite instructions to, ‘please switch off your cell phones, leave the room quickly at the end as we have to turn it round rapidly, drink responsibly, and don’t drive. If you need a lift let us know and we will give you a lift home.’ Oh Victoria, I love you. This is a city where people smile at you in the street, and take time to chat, adding a chilled atmosphere which is even more in evidence at the tasting sessions in the evening. This is a whisky show, but also a social gathering, a chance for folks to dress up, catch up with friends. It’s education with an engaged, and eager crowd of all ages. ‘They get it here,’ said one importer. ‘They know their whisky, but are always looking for something new.’ This year that included Scotch, Irish, Japanese and American whiskies as well as the Canadian big hitters and the increasingly confident collection of local producers such as the excellent Glen Saanich and Shelter Point and some seriously impressive releases from the Yukon’s Two Brewers. You did a bit of a double take at the G&M and Springbank stands, for there were the bottles which had been banned. Then you realised that they were all sealed, bar a 10-year-old Springbank and a Benromach of the same age. Richard Urquhart had managed to find both in Government-owned stores allowing them to pour both. The others were just window dressing as they had been bought in independent retailers. ‘It gets even more ridiculous,’ said a bemused Melanie Stanger of Springbank. ‘I can’t pour this Kilkerran, but you can go to the Strath pop-up store in the lobby and buy a bottle.’ I know. Go figure. Another chipped in: ‘The Canadian Government makes CDN$15billion in liquor taxes per year. Do you really think that these raids were an attempt to get much needed revenue? No. It’s to put people in their place.’ But then the smiles would return. This is Canada after all and this is the big-hearted festival, run by volunteers, and whose proceeds go to local charities, not into organisers’ back pockets. Will things change? It could be the catalyst for much-needed change in the law. Will the festival change? No. Perhaps it might continue to fine-tune itself every year, but there’s little chance anything will stop it being the friendliest whisky show in the world. Heading way out west for the 11th edition of the must-attend event of the Canadian whisky calendar. 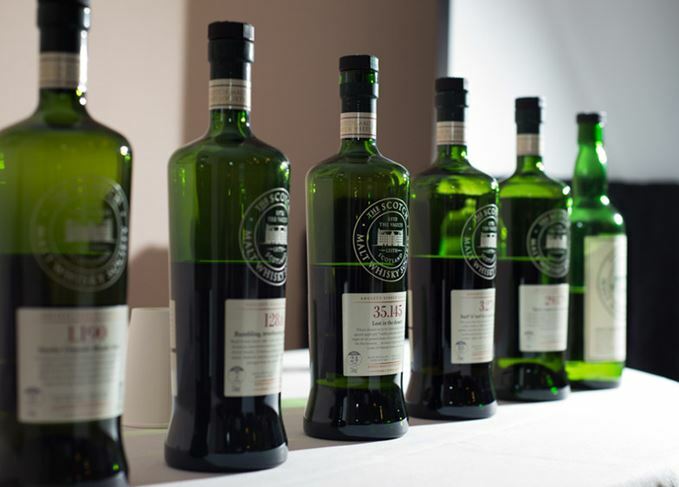 Armed police raided Canadian whisky bars for selling SMWS whisky ‘illegally’. Is cannabis whisky on the way? As Canada legalises recreational cannabis, how will whisky distillers react? Another high-quality option just made the whisky world that bit more exciting, says Dave Broom.